Burning video to Blu-ray movies on Mac is no big deal if you have proper Mac Blu-ray burner software. Leawo’s Mac Video to Blu-ray Converter helps you convert and burn video to Blu-ray on Mac (Mac OS 10.6 and later) in simple clicks. Leawo Blu-ray Creator for Mac is a professional Mac Blu-ray burning software tool that could convert and burn videos from various sources to Blu-ray disc, folder or ISO files on iMac or MacBook. Follow the below guide to know how to convert video to Blu-ray on Mac. Download and install Leawo Blu-ray Creator for Mac on your iMac or MacBook (PC users could download the Windows version of Leawo Video to Blu-ray Converter to burn Blu-ray movies on PC). Meanwhile, get source video files ready and insert a blank writable Blu-ray disc into the Blu-ray recorder drive of your computer if you want to convert video to Blu-ray disc on Mac. 1. Launch Leawo Blu-ray Creator for Mac. Click the "Add Video" button to browse and load source video files. After loading, set output Blu-ray disc type and bit rate at the bottom. 2. Select a disc menu for output Blu-ray content from the right sidebar. Click the middle eye-shape icon to preview selected disc menu. You could even edit disc menu as you like. 3. Right click loaded video file and then choose "Edit" option to edit loaded video files. 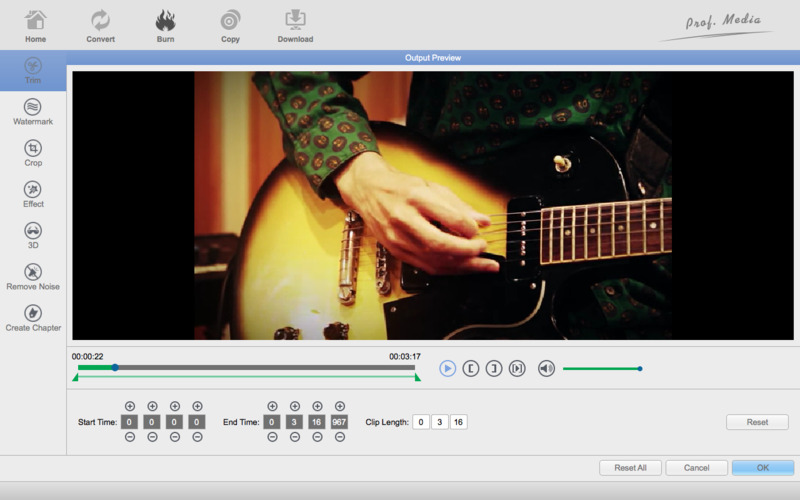 You could trim video length, add watermark, crop video size, apply effect, etc. 4. Click the big green "Burn" button to set "Burn to", "Disc Label" and "Save to" options. After these, click the bottom "Burn" button to convert video to Blu-ray. To burn video to Blu-ray disc, insert a blank writable Blu-ray disc into the Blu-ray recorder drive first. Then, according to the type of Blu-ray disc you’ve inserted, set output disc type at the bottom left corner (as mentioned in Step 1), set the inserted disc as target under "Burn to" option in Step 4. If you don’t want to add a disc menu, you could click "No Menu" option on the right sidebar of the main interface. On the disc preview panel, you could click the pencil-shaped "Edit" icon to edit selected disc menu. You could rename titles, adjust the title position and content, change text font, size and color, load background image/video/audio, edit the content on chapter list pages, etc. On the video editing panel, you could also choose to add 3D movie effect from the 6 preset options: Red/Cyan, Red/Green, Red/Blue, Blue/Yellow, Interleaved, and Side by Side. Besides Leawo Blu-ray Creator for Mac, you could still get several other wonderful Mac video to Blu-ray converter programs to convert video to Blu-ray on Mac easily. Total Media Converter Ultimate is a comprehensive and all-in-one media converter suite that comprises almost all multimedia solutions, including: Blu-ray ripper, Blu-ray creator, DVD ripper, DVD creator, Blu-ray copy, DVD copy, video converter, audio converter, photo slideshow maker and burner, etc. It solves most media conversion issues and format incompatibilities. With this Total Media Converter Ultimate, you could freely get improved digital entertainment as you want. imElfin Blu-ray Creator for Mac is the world’s top-rated blu-ray disc maker software which enables you to create all videos to DVD/Blu-ray discs on Mac OS computers. Additional, Blu-ray Creator can burn various video formats including HD camcorder videos straight onto Blu-ray discs (BD-R, BD-RE, BD-25, BD-50) and AVCHD DVDs (DVD-5, DVD-9, DVD-R, DVD+R, DVD-RW, DVD+RW, DVD+R DL, DVD-R DL). Besides, this Blu-ray Creator comes with powerful video editing functions for the output video: trim, crop, adjust effect, add image or text watermark. 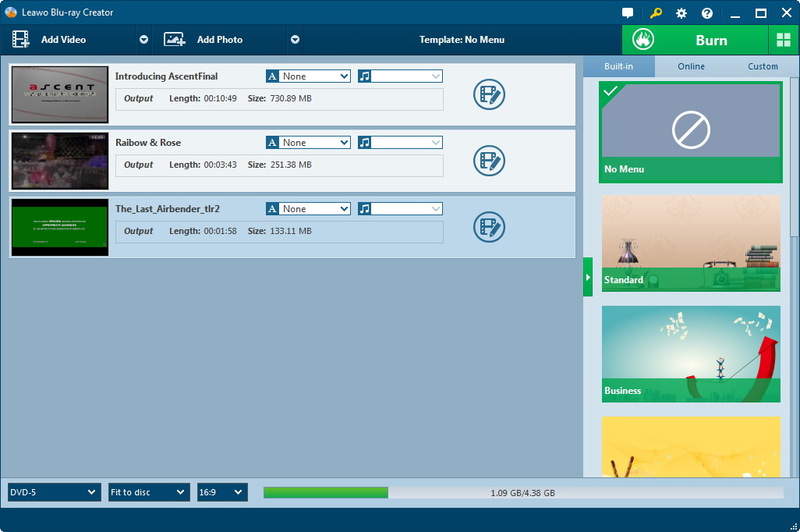 Moreover, there are multiple menu template themes to select and you can add label, background picture and music according to your preference when you burn video to Blu-ray/DVD on Mac OS, also convert 2D video to 3D DVD/BD movies. DVDFab Blu-ray Creator for Mac is powerful and professional Mac Blu-ray Creator to burn video to Blu-ray content on Mac. It converts HD videos from camcorder, iPhone, iPad and common SD video files in different formats into BD or AVCHD DVD for playback on standalone Blu-ray player, or convert into Blu-ray video folder to play on iMac or Macbook with media player software, like DVDFab Media Player.